The most visually thrilling painting in Phyllis Bramson’s thirty-year retrospective is the earliest one. “Shipwreck” (1987) depicts an emotional, rather than nautical, disaster. The upside-down, bare-bottomed heroine clings to the mast as waves swirl around the sinking ship. It’s theatrically melodramatic, but also feels like the response to a real situation, and might explain the direction the artist would take thereafter. In response to a world where she doesn’t quite fit, she has created a comfortable haven for unrequited passion, much as Henry Darger once did. Darger traced out illustrations from newspapers and magazines, while Bramson directly incorporates mass-produced painting and sculpture into her work. Her use of kitsch is not ironic. She has transformed it into an expression of post-traumatic, and postmodern, despair. There is neither hope nor anxiety for the future—just the recognition of past wounds that will never heal. Immersed in a brightly colored fanciful world of cartoonish figures, her Buddhist shrines may be more goofy than peaceful, but they still feel sincerely devotional, and more about suffering than joy. She has created a gentle la-la-land to comfort those who have had enough emotional tension and struggle. 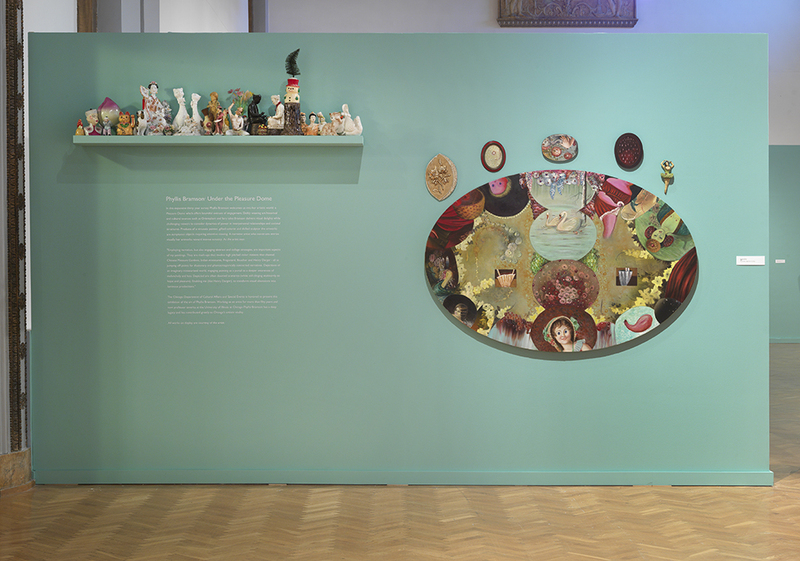 A shelf full of tchotchkes at the entrance to the exhibit reminds us of the qualities of the gift shop art that she uses. With no inner dynamic or apparent attempt to interact with surrounding space, each one seems to say “I am harmless and cute, so why not love me?”—the desperate plea of children as well as young women in patriarchal society. 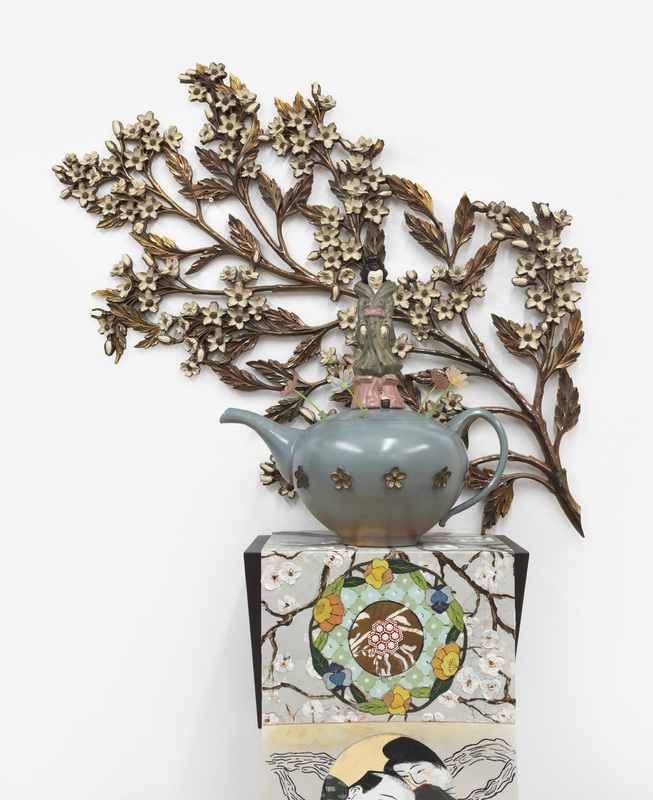 With skills befitting her past as a professional window dresser, Bramson arranges each to seamlessly fit wherever placed, even as she re-contextualizes it to feel strange and surprising. That strangeness is enhanced by intermittent suggestions of the sexual act, so mysterious and threatening to pre-adolescents.